Traversing the coast along the Pacific Northwest into the Fraser River in British Columbia, Canada is a picturesque and mesmerizing experience, unless you are a sockeye salmon (Oncorhynchus nerka) swimming through it. While Fraser River sockeye salmon attempt to reach natal spawning grounds up to a grueling 1,000 kilometers upstream, climbing upwards to 1200 meters in elevation, they endure a barrage of natural and anthropogenic stressors. Amazingly, after evading hungry predators, tolerating aquatic pollution, enduring exhausting fisheries captures and exposure to warming river temperatures, sockeye salmon reach spawning areas and muster up enough energy to compete for mates and reproduce. Sounds like quite the wildlife success story. Or is it? Sockeye salmon fry in the UBC salmon lab. Natalie Sopinka (UBC). Sockeye salmon offspring embody the next generation of fish that will leave freshwater, grow in the ocean and return home to reproduce, ultimately sustaining populations of a globally iconic species. However, since the 1990s populations of Fraser River sockeye salmon are steadily declining. Members of Dr. Scott Hinch’s Pacific Salmon Ecology and Conservation Laboratory at the University of British Columbia (UBC) are using telemetry technology provided by the Ocean Tracking Network to find out why. Comprehensive tracking studies in both the marine and freshwater environment have established that prolonged captivity, thermal stress, fisheries captures and physiological indicators of stress (e.g., blood biochemistry, reflex impairment) can predict the survival of migrating fish. The bottom line: stressed fish have lower survival and are less likely to reach spawning grounds and reproduce. But wait! Not all fish perish and even some of the most stressed individuals reach spawning areas and successfully spawn. Are these stressed out parents producing offspring capable of surviving the demanding life of a sockeye salmon? Telemetry work led by Dr. Timothy Clark (now at Australian Institute of Marine Sciences) tracks the migratory behaviour of acoustically tagged sockeye salmon smolts migrating downstream to the ocean. Dr. Clark has found that survival and migration rates vary among individuals. Could the stress experienced by parents account for these differences in survival of smolting offspring?Importantly, how do we now connect parental stress to offspring quality, performance, and behaviour? Natalie Sopinka’s PhD research is identifying the transgenerational effects of stress in sockeye salmon. 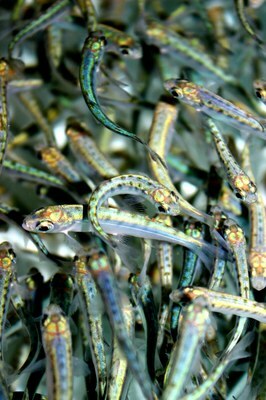 Though salmon embryos and young fry cannot be tracked using telemetry due to limitations on small tag size, offspring from parents exposed to stressors can be monitored throughout early development and life history traits can be quantified. Natalie Sopinka with tanks of sockeye salmon fry in the UBC salmon laboratory. Kendra Robinson (UBC). In a recent study, Sopinka investigated the effects of parental stress on offspring survival and behaviour in a population of sockeye salmon that migrate 100 kilometers up the Fraser River to spawn in the Harrison River near Chilliwack, British Columbia. Adult fish migrating to spawning grounds were caught from the Harrison River six weeks prior to spawning and brought to a nearby Fisheries and Oceans Canada research laboratory where fish were held in large tanks. To mimic a stressful migration, captive fish were chased daily, whereas control fish were not chased. Coinciding with peak spawning in the wild, eggs were collected from mature chased and non-chased fish, as well as from adults that naturally migrated to spawning areas in the Harrison River. Eggs from captive fish were smaller than eggs developed in naturally migrating females in the wild. Smaller eggs in a big fish world don’t fare well: reduced survival, body size, growth rates and predatory evasion are all consequences of smaller egg size. Indeed, lower survival and smaller body size at emergence (full yolk sac absorption) was observed in offspring reared from mothers that were held in captivity, a chronic stressor that the research team of Dr. Hinch has confirmed influences the stress physiology of sockeye salmon. Surprisingly, when swimming performance of emergent fry was compared, offspring from the most stressed mothers were better swimmers than those from less stressed mothers. Collectively, the results tell a unique story of the consequences and potential benefits of parental stress, and further investigation is ongoing to track how ecologically relevant offspring traits are affected by stress experienced by the previous generation. Click Here to Read Natalie's Blog.